The Amazon Fire has blasted into the tablet market and now just needs a definitive app to call its own. Physics apps are wildly popular on Android as a whole but tailored very specifically for the Amazon Fire is this physics app...with Cows! Of course it's not just an Amazon Fire App with physics it's a crazy game based on the age old country tradition of tipping cows! It's a lot safer to do a simulation on Android than it is to trudge knee deep in the smelly stuff and anger 2 and a half tonnes of Prime Beef. But for all those Country Kids who can't get enough of cow tipping and all those city slickers who want to give the beef a prod ,this app is just perfect! With some very lovable cows HAPPY COW TIPPING brings lots of physics puzzle fun to your Amazon Fire. It's also pitched at just the right level and kids will love the Android Game whilst adults will get a lot of jollys from seeing Cows flying through the air too! There's 30 levels of cow tipping fun to be had and the game will keep any physics puzzle app fan entertained. The main selling point is that the Amazon Fire doesn't have many quality apps yet, so when an app as fun as HAPPY COW TIPPING comes along it's expected that Fire Users will quickly jump at the chance to play what is in anyone's books, a really fun physics game. If more levels are brought out in the future this will certainly be a hit. 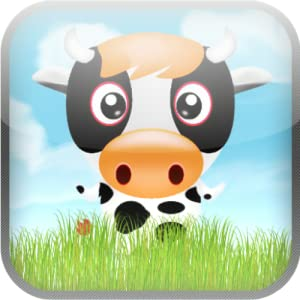 Download HAPPY COW TIPPING game for the AMAZON FIRE -the best bovine based fun you'll have this year!